Design & development, which is an integrated part for manufacturing custom build products, are done by us for quite a long time. 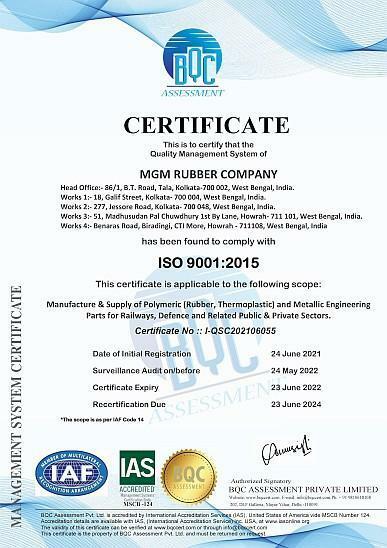 With a view of producing Industrial Rubber Moulded Products by continual quality improvement, we have set up our own R&D unit, manned by the most professional and qualified personnel with a motto to reach the optimum level of quality and also to provide unmatchable satisfaction to our every valued clients. The wide range of R&D testing facilities & various machinery gave us complete control towards time bound development of almost any kind of rubber and rubber-metal bonded items. In order to expand our R&D facility we have joined our hands with partners like Indian Institute of Technology (IIT, Kharagpur) & NICCO Corporation. Improving in these key area, in recent years other than regular domestic developments, we developed many import substitute products for several imported locomotives used in Indian Railways namely - products for Hitachi Loco, ABB Loco, GM Loco, Alsthom-LHB Coaches etc. For thin industrial items we have developed E-Beam radiation curing system to produce optimum cross-linking, which enhanced mechanical & dynamic properties like compression set, oil resistance, crack growth resistance, tensile strength, endurance (fatigue) etc.